Inspired by a comment in Wednesday’s Tech session, I have decided to dedicate Friday’s posts to all things Flipped. This website seems to be the mothership of the Flipped learning method- from resources, to literature reviews, they even have a sign up sheet for Flipeed Classroom open houses where you can attend a flipped classroom in another school or (cough, cough, I am talking to you Mr. Flipped) even host an open Flipped classroom! Something that might be of interest to English and French teachers is an upcoming webinar in February called Flipped Lit on Tuesday February 25, 5:00 pm. Oh, and yes, they are free! First of all, I want to say a big thanks to Greg Scruton, intrepid Math and Multimedia teacher, for giving us a condensed version of his Distinguished Educators Workshop at Mcgill on very short notice. He has graciously given me permission to post the links he used during his presentation which I will annotate for all you poor souls who were not able to attend. Greg began by giving us a list of pros and cons for flipping the classroom. A lot of them we have already heard (students can watch videos in their own home where they will be less distracted, they can stop and rewind, replay the video as much as they need, etc.) But he also added “Can’t interact with the teacher” as one of the pros (it was also the only con). He justified putting this in the pro section because it meant that the student couldn’t ask that very urgent question (either valid- in which case it was probably going to be answered anyways if they had just given the teacher a couple of minutes more- or completely invalid-eh. Why do we even need to know this? type of query). Because Greg requires his students to write notes about the videos and then post them on their individual math blogs, he knows who has watched the video and how much they understand. He then gave us examples of three different types of videos he makes for his students to watch at home. He noted that there are many ways to create a video, and many tools you can use. Although it feels a bit overwhelming, it is one of those things that seem more complicated when explained than when you actually sit down and do it. 2. 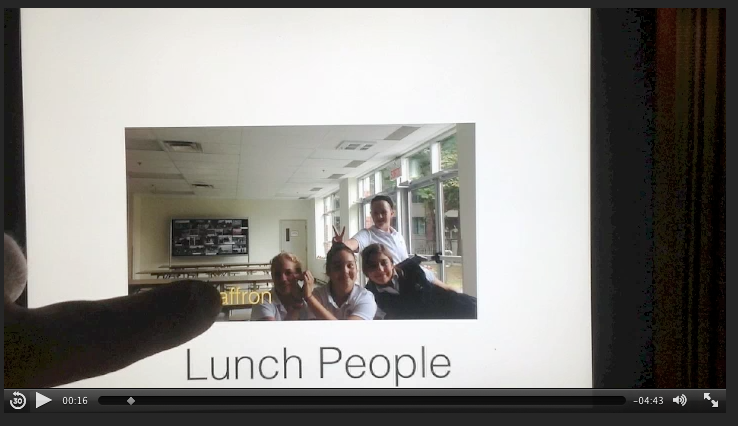 Screen Capture using Quicktime and AirPlay (at our school, we all should have quicktime on our devices, but for access to Airplay you need to talk to our IT person). Although Greg is now an expert at the flipping the classroom model and has developed his own methods of creating videos, I want to re-iterate that their are many, many ways to skin a cat – no, sorry. I mean to make a flipped classroom video. I know teachers who record their lessons on a whiteboard app and post the link to their class page. The trick is to play around with several different methods and see which one works for you. As Greg said, don’t think you are going to get it perfectly the first time. It takes a little practice. Also, ask! That was a lot of information all in one go-don’t be afraid to ask for a one-on-one tutorial. Flipped classrooms are one of the more popular trends we’ve seen since Edudemic was created, and it is certainly one of the most long- lasting.